Payment services giant Mastercard is launching its developer portal. Sound familiar? It should. The company’s original launch of its developer platform took place around 2010, so today’s launch is more of an expansion of the platform. The new developer gateway, which aims to facilitate partner integration, offers a single location where third-party developers can access more than 25 updated APIs. The new APIs span payments, data, security, financial inclusion, and “experimental” categories. This comes about seven months after the company’s competitor Visa opened its Developer Center which hosts just over 25 APIs, as well as documentation on Visa Tokens and microtransactions. Both companies showed off their APIs at FinDEVr Silicon Valley 2014. Mastercard’s presentations focused on its Developer Zone and explained how developers can select the best API. Visa showed Visa Checkout, as well as Apple Pay integration with Authorize.Net and CyberSource. For more developer-focused technology check out our developer event on October 18 & 19, FinDEVr Silicon Valley. We’ll be hosting 46 companies as they present their latest APIs and SDKs to a crowd of leading developers from across the globe. Tickets are still available but limited, so register today. Are you building new financial technology? Be sure to check out coverage from our recent developer conference in San Francisco. We’retaking the fintech developer tool showcase to New York on March 29 & 30, 2016. Stay tuned for details. CenturyLink adds Former US Senator Mary Landrieu to Board. Worldpay employees evaluating use of finger vein technology to authenticate payments at the POS without the need for a card. Let’s Talk Payments interviews Hyperwallet CEO, Brent Warrington. Pymnts chats with Nymi founder & CEO, Karl Martin. Xero piloting program to allow users to file their GST returns. MasterCard announced Ed McLaughlin as new Chief Information Officer. Backbase set to launch its first hackathon 19 and 20 of June. Spreedly now supports third party tokens to help merchants continue to process transactions using their existing gateway-specific tokens from within Spreedly. SandHill mentions SnoopWall as 1 of 5 Cool Pre-VC Cybersecurity Startups. Xero developing business apps that Apple is using to help market the iPad’s use in business. Tech.co looks at how Trulioo’s API defends startups against credit card fraud. 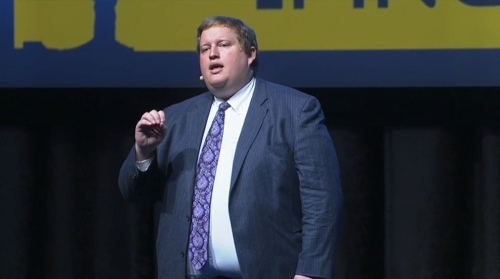 NerdWallet turns to Trulioo CEO Stepehn Ufford CEO offers 5 steps to protect against cyberthreats. Dynamics announced today that it had completed a Series C investment round, raising $70 million from new and existing investors. Along with MasterCard is new investor, Canadian Imperial Bank of Commerce, both of which teamed up with existing investors, Adams Capital Management and Bain Capital Ventures. The total capital for Dynamics is now more than $110 million. 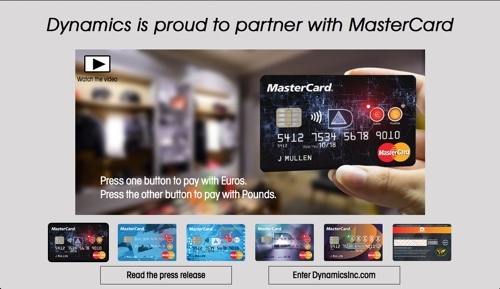 In addition to the investment, MasterCard will enter a joint commercial initiative with Dynamics to bring the company’s cards to businesses in Mastercard’s global payments network as well as CIBC’s customers. It is interesting to hear the way MasterCard and CIBC executives talk about the card technology from Dynamics. For these companies, as far as commerce is concerned, plastic cards and smart devices have more in common than some may think. Dynamics innovations have included a battery-powered card that enabled consumers to change the data stored on their EMV chip simply by pushing buttons on the card itself, a system that provides loyalty rewards on credit transactions faster by using the credit transaction data itself and, most recently, the first multi-network card that combines both innovations. Founded in 2007 and headquartered in Pittsburgh, Pennsylvania, Dynamics has won multiple Best of Show awards for its card technology. The company’s last Finovate appearance was at FinovateFall 2014 in New York. With the news media focused on the potential impact of an Apple entering the mobile payments space, it’s worth remembering that there are already sizable technology companies with mobile payments innovations already in the field. MasterCard, which announced earnings this week, may be an obvious example. But for anyone who needed reminding, the fact that MasterPass, the company’s mobile payment platform, earned such high marks from CEO Ajay Banga, should help. Here are a few choice notes and quotes from the earnings call that highlight MasterCard’s success and strategies for MasterPass. First, MasterPass was launched in three new markets in the second quarter of 2014: Singapore, Poland, and South Africa. That puts the total number of markets at 10, with another four planned by the end of the year. Making MasterPass a technology that plays well with others is a major goal. MasterCard launched its in-app payment feature in the previous quarter. It can now count Starbucks in Australia and Major League Baseball among the major marketing entities that have committed to deploy MasterPass in their own branded apps. The clue to how MasterCard might succeed where others have failed may be found in a profile of the company’s CEO recently published in Fortune.com. Quoted in the feature by Daniel Roberts, former MasterCard emerging payments specialist Ed Olebe pointed to the company’s “basic capability in the physical world and some capability in the digital world” as a major advantage as a player in the digital payments world. MasterCard, via its MasterCard Developer Zone, is a Platinum Sponsor of FinDEVr, the first event for fintech developers. To find out more about the inaugural FinDEVr conference in San Francisco, October 1 and 2, visit our FinDEVr page here.